Posted February 13, 2017 by Christian Bone & filed under Lists. 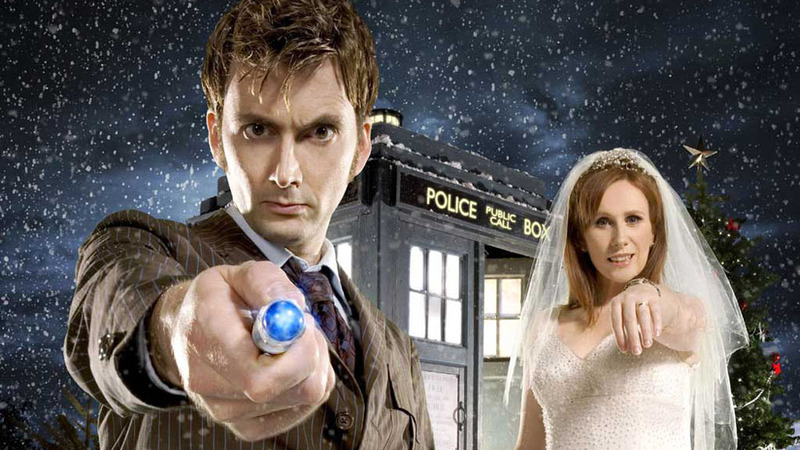 While classic Doctor Who was famously romance-free for the most part, 21st century Who – and its associated productions – seems to have had as many weddings as a soap opera. 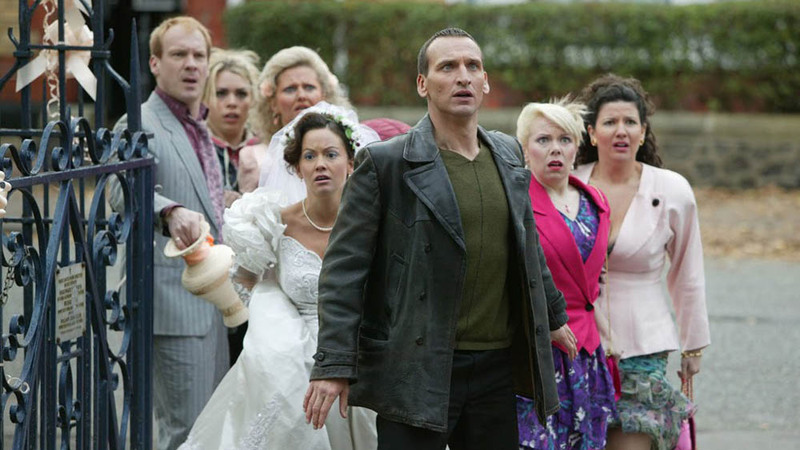 And if you live in the Whoniverse, you are just as unlikely to have a trouble-free nuptials as if you lived in Walford or Weatherfield. Except the problem wouldn’t be your fiancé’s long-lost never-before-mentioned ex interrupting the wedding but something like reality warping around you or maybe finding yourself impregnated by an alien. Sometimes you don’t even have to know the Doctor to have your special day messed up, as poor Stuart and Sarah found out in ‘Father’s Day’. Due to Rose going back in time and saving her father Pete’s life, their wedding was besieged by the Reapers, great big bat monsters that had come to sterilise the wound in time. Stuart and Sarah are particularly unlucky, as the Reapers have never bothered to show up for any other instance of time-meddling in Doctor Who history. Maybe they were just annoyed they didn’t get an invite? 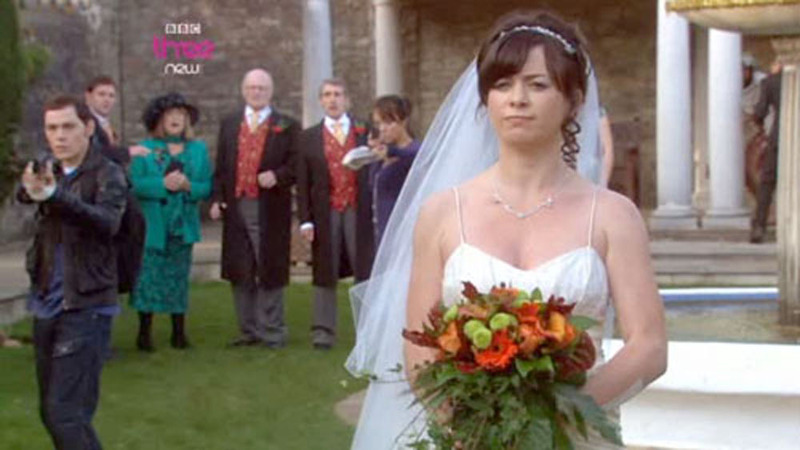 The ever-oblivious Donna should have known not to schedule her wedding on Christmas Day, the one day that alien business is guaranteed to go down in Doctor Who. She was asking to be whisked off from the aisle to the inside of the TARDIS, really. Of course, it all turned out for the best in the end as Donna’s hubby-to-be Lance was revealed to be working with the Empress of the Racnoss. Eventually, Donna tied the knot properly this time, with a much nicer bloke named Shaun in ‘The End of Time’. Good on her. Being Doctor Who’s naughtier, more-adult sibling, Torchwood took the ‘wedding gone wrong’ idea and mixed in an unwanted pregnancy. Thankfully, the Torchwood team are on hand with Owen’s singularity scalpel and some memory-wiping drugs to ensure the day eventually runs smoothly. The 1st Doctor got engaged in The Aztecs but then effectively ran out on his fiancée. That’s worthy of a mention surely? That was Queen Elizabeth the 1st (Victoria was the one who knighted and exiled him on the same day) and IT WAS MENTIONED IN THE ARTICLE. I would like to hear the Wedding of River Song explained. Why in the Universe did getting married to River restore the timeline proper? oh and by the way… “Who” is not his last name. I mean we don’t actually know the Doctor’s true first name let alone his last name.